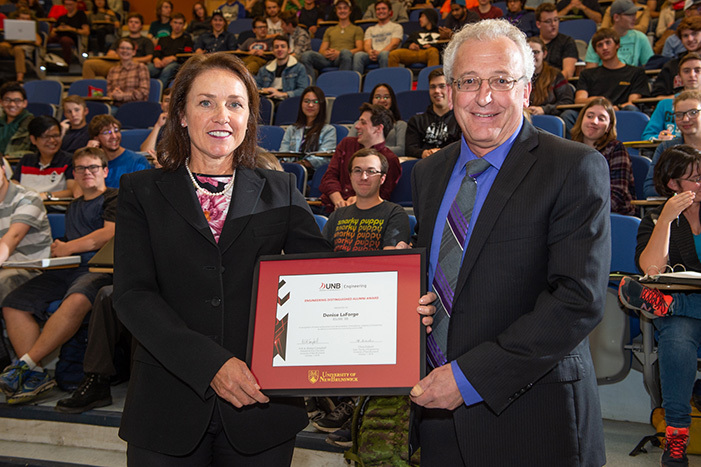 UNB alumna Denise LaForge has been inducted to the Engineering Wall of Fame at the University of New Brunswick for her entrepreneurial successes and accomplishments in the oil and gas industry. Ms. LaForge, originally from Edmundston, is the first woman to be inducted to the UNB Engineering Wall of Fame. Ms. LaForge is chairman and CEO of Denco Financial Holdings, a company with investments focused in technology, energy, real estate and the wholesale distribution sector. In 2003, she co-founded and served as chair of the board of Tarpon Energy Services, a leading supplier of electrical and instrumentation services, control systems and modular solutions. "Denise is a shining example of what you can achieve when you dream big, make plans and take risks," said UNB engineering dean Dr. Chris Diduch. "Her career and entrepreneurial success are incredibly inspiring to current engineering students and young alumni. She is certainly a deserving candidate for this award and we're proud to add her to our Wall of Fame." In the past, Ms. LaForge also worked as vice-president of marketing and sales of Zedi Inc., which specialized in production operations management and the delivery of systems and services that help oil and gas producers better manage people, assets and information. She holds a bachelor's degree in mechanical engineering from UNB and a master's degree in business administration from the University of Calgary. Ms. LaForge received UNB's Alumni Award of Distinction in 2008 and has given generously to community and charitable organizations in New Brunswick, Calgary and Montreal. Ms. LaForge was inducted to the UNB Engineering Wall of Fame at a ceremony on Oct. 1, where she shared her wisdom with 250 students, taking them on her journey from first-year classes at Head Hall to being on the wall in its lobby. The induction is bestowed upon individuals who receive the Engineering Distinguished Alumni Award, which is presented to trailblazers in industry and who have contributed to the community through volunteer, philanthropic or advocacy efforts.